My previous year was dedicated to traveling, exploring and absorbing myself in this new western world of East and mid-west in United States. I also spent some time trying my hands at Canvas paintings and polymer clay crafts (that I deeply fell in love with) and will eventually share those works here. Right at the beginning of this year I visited one of the most beautiful natural sights in Madison with my husband called 'Cave of the Mounds', which was discovered in 1939. The delightful beauty of this limestone cave illustrates nature's intricate handiwork, with many beautiful structures inside. Limestone is majorly made up of Calcium Carbonate, that came from shells of marine organisms on ancient ocean floors. Since these are water soluble, rainwater created cavities in them forming a cave. 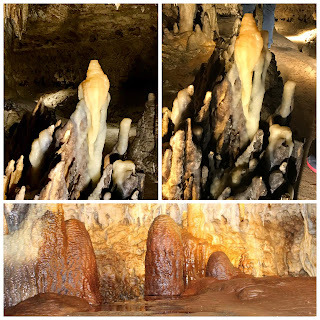 The water that formed cavities, carried calcium carbonates to other areas creating new formations inside the caves. Many of these formations and structures took millions of years to form. My previous visit to any such limestone cave was back in India in Andaman and Nicobar Islands, though those caves did not have cavities as deep as this. And hence walking here was a richer experience for me. During our walk, we spotted two places with peculiar formations (specifically to Indian eyes) closely resembling Indian Gods. The first was common and often found i.e. Shiva-ling. The second one resembled Lord Ganesha. With a quiet understanding, we passed a smile at each other. Both of us knew, if it was in India, this would have been a place of religious interest. On our way back home, we were discussing about such places in India where devotees go despite the journey being life threatening. And many people each year lose their lives to be at those religious places. Interestingly, many of the relatives of dead consider it to be auspicious when their known die there (since everyone will die someday), believing them to reach heaven. Perhaps it is the spirit of adventure and the hope of finding something bigger than ourselves that makes us go such great lengths. Since these caves were formed on ancient sea-bed, the limestone here were rich in many minerals and fossils. We bought fossils of fish, which being a biologist’s wife now, is a cherished possession at our home. The Ammonites (spiral shaped fossil) were sea creatures that lived from 65 to 350 million years ago and are now extinct.